FILE - U.S. President Donald Trump, right, meets with Russian President Vladimir Putin at the G-20 Summit in Hamburg, Germany, July 7, 2017. When the U.S. fired Tomahawk missiles at a Syrian airfield a year ago after a chemical weapons attack, the Pentagon gave Moscow advance warning to get its personnel out of harm's way. U.S. President Donald Trump has taunted Moscow to "get ready" for "nice and new and 'smart"' missiles coming to punish Syria for a purported chemical attack on Saturday that killed at least 40 people. The tweet followed Russia's warning that it will strike at incoming U.S. missiles and their launch platforms. A stern statement last month by Russia's top military officer effectively drew a red line on any U.S. strike. Gen. Valery Gerasimov, the chief of the Russian military's General Staff, said Russian military officers are at Syrian facilities throughout the country and warned that "if a threat to our servicemen emerges, the Russian armed forces will take retaliatory measures against both missiles and their carriers." 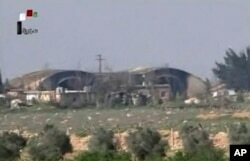 FILE - This frame grab from video provided April, 7, 2017, by official Syrian TV shows the burned and damaged hangars hit by U.S. Tomahawk missiles at the Shayrat air base southeast of Homs, Syria. A pinpoint U.S. strike on Syrian targets that does not harm Russian personnel "will allow Trump to say that the Assad regime has paid a heavy price ... and Russia, in its turn, will be able to limit itself to ringing statements," said Fyodor Lukyanov, the head of the Council for Foreign and Defense Policies, an association of top Russian political and security experts. "The context of the relations has changed radically in the past year: We're in a state of a real and tangible Cold War," Lukyanov said. President Vladimir Putin's top adviser, Vladislav Surkov, said in an article released earlier this week that Russia has abandoned its centuries-long aspirations of integrating into the West and is bracing for a new era of "geopolitical loneliness." Surkov warned that "it's going to be tough," but added cryptically that "it'll be fun." 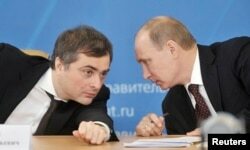 FILE - Russian Prime Minister Vladimir Putin, right, talks with Deputy Prime Minister Vladislav Surkov as they attend a meeting in Kurgan, Feb. 13, 2012. "The situation is pretty bad, but it shouldn't be overdramatized," Alexei Malashenko, a leading Russian expert on Syria said in televised remarks. "I don't believe that a clash between Russia and the U.S. is possible." Vyacheslav Nikonov, a senior lawmaker in the Kremlin-controlled lower house of parliament, said in televised remarks that the Russian military was getting its electronic countermeasures and air defense assets ready for action. He added on a combative note that the situation offers a "good chance to test them in conditions of real combat." Retired Lt. Gen. Yevgeny Buzhinsky, the former chief of the Russian Defense Ministry's international department, warned that Russia has thousands of military advisers in Syria "practically in every battalion," and a strike on any Syrian facility could jeopardize their lives. He warned that Russia and the U.S. will quickly find themselves in a major conflict if they allow a collision in Syria to happen. "I have an impression that Americans' survival instincts have grown numb, if not vanished completely," Buzhinsky said. "They seem not to really believe that Russia will give a tough military response and expect some sort of a local brawl, exchanging some minor blows. It's a miscalculation. Any clash between Russian and U.S. militaries will expand beyond a local conflict and an escalation will be inevitable." "What if the war starts tomorrow?" the front page of Moskovsky Komsomolets clamored on Wednesday. Russia's best-selling newspaper Komsomolskaya Pravda wondered: "Is macho Trump going to start World War III?" Even former Soviet leader Mikhail Gorbachev weighed in. The 87-year-old former president compared the tensions to the 1962 Cuban missile crisis and said he feels "great concern."